At the invitation of the government of Colombia, Minister of Transport Li Xiaopeng, as President Xi Jinping's Special Envoy, will travel to Bogotá to attend the Colombian presidency handover ceremony on August 7. Since the establishment of diplomatic ties in 1980, the China-Colombia relations have been growing steadily as evidenced by close high-level exchanges, ever stronger political mutual trust, increasingly deepening practical cooperation in various areas and fruitful outcomes in cultural exchanges. At the invitation of the government of Colombia, President Xi Jinping decided to send the Special Envoy to attend the Colombian presidency handover ceremony, which demonstrates the great importance China attaches to its ties with Colombia. The Chinese side is looking forward to working with the new Colombian government to build on past achievements and usher in a bright future, move forward bilateral relations and deliver greater benefits to our two countries and two peoples. Q: After the establishment of the new government in Malaysia, there has been a lot of interest in the prospect of China-Malaysia relations. We have noted that State Councilor and Foreign Minister Wang Yi has wrapped up his visit to Malaysia. Can you offer us more details? What outcome and consensus have been achieved by the two sides? Firstly, our two sides reaffirmed our strong commitment to developing bilateral ties. China-Malaysia friendship boasts a long history. Since the establishment of diplomatic relations, our bilateral ties have achieved remarkable progress in various areas, which has delivered huge benefits to our two peoples. China always takes Malaysia as a priority in its diplomacy, especially neighborhood diplomacy. China's friendly policy towards Malaysia is steady and consistent, which will remain the same despite the change in Malaysia's domestic political situation. The Malaysian side also said that it always regards China as a good neighbor and good partner and that the change in its domestic political situation will not affect China-Malaysia ties. The new Malaysian government values its relations with China and the friendly cooperation between our two countries will enjoy steady development. Secondly, during the visit, our two sides had effective communication on and made good preparations for Prime Minister Tun Dr. Mahathir's visit to China. Prime Minister Tun Dr. Mahathir is Chinese people's good and old friend. During his long tenure, China-Malaysia relations achieved rapid development. He chooses China as his first destination for official visit outside ASEAN countries, which once again speaks volumes of the great importance the Malaysian side and Prime Minister Tun Dr. Mahathir attach to China as well as the friendship between our two countries. The Malaysian side said that it has high expectations for Prime Minister Tun Dr. Mahathir's visit to China. We are convinced that Prime Minister Tun Dr. Mahathir's upcoming visit will elevate China-Malaysia ties to a new height and draw up a new blueprint for our mutually beneficial cooperation. Thirdly, our two sides held in-depth discussions on jointly advancing the Belt and Road Initiative. China and Malaysia are natural partners in this regard. Malaysia boasts unique geographic advantage in advancing the Belt and Road Initiative. Prime Minister Tun Dr. Mahathir and other Malaysian senior officials said that the Belt and Road Initiative proposed by President Xi Jinping represents an important opportunity for the regional countries to achieve common development and prosperity. The Malaysian side will actively support and participate in this initiative. Both sides believe that jointly advancing this initiative on the part of China and Malaysia will not only open up broader prospects for our bilateral cooperation and fuel Malaysia's national development but also contribute to the prosperity and rejuvenation of Asia. Fourthly, our two sides sent out the positive signal of upholding multilateralism and free trade. Both China and Malaysia are developing countries. We both follow an independent foreign policy, cherish the Asian values, oppose power politics, stay committed to regional cooperation, especially the East Asian integration process and stand for democracy in international relations. 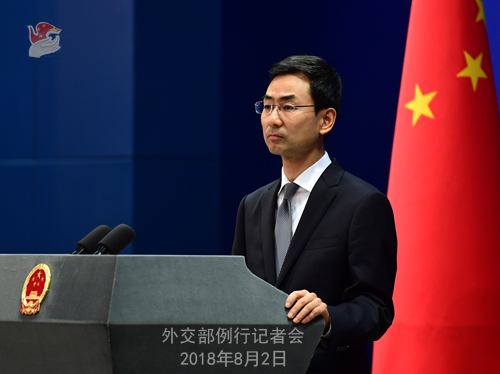 Our two sides agreed that under the new circumstances, China and Malaysia should enhance communication and coordination to jointly uphold free trade, multilateralism and the rules-based international order, promote the building of the East Asian economic community and maintain the solidarity and safeguard the legitimate development interests of the developing countries. The Chinese side stands ready to work with Malaysia to take Prime Minister Tun Dr. Mahathir's visit to China and jointly advancing the Belt and Road Initiative as an opportunity to further deepen and expand our practical cooperation across the board, open up a new bright future for China-Malaysia ties and contribute more to the peace, stability, development and prosperity of the region. Q: The Trump administration is proposing increasing the tariff level on $200 billion of Chinese imports from the original 10% to 25%. Yesterday you said China would not give in to pressure and China would take measures in response. Could you tell us specifically what measures China will take? Firstly, we urge the US side to adopt a correct attitude and not attempt to blackmail China because it will not work. Secondly, we urge the US side to come back to its senses and refrain from acting impulsively, otherwise they will end up hurting themselves. Q: DPRK Foreign Minister Ri Yong Ho has just arrived in Beijing and is expected to attend the Foreign Ministers' Meetings on East Asia Cooperation in Singapore. Is China going to have a bilateral meeting with him? And if so, what is your expectation for that? A: State Councilor and Foreign Minister Wang Yi will attend the Foreign Ministers' Meetings on East Asia Cooperation in Singapore. On the sidelines of these meetings, State Councilor and Foreign Minister Wang Yi will hold a series of bilateral meetings. You may have noted that yesterday he met with his counterparts from some countries and we have issued the relevant information in a timely manner. If State Councilor and Foreign Minister Wang Yi meets with his DPRK counterpart in Singapore, we will also release the relevant information in a timely manner. Q: Two women with tourist visas from Russia's Republic of Buryatia arrived in Beijing on July 27. They should have been arranged to work in a restaurant. However, after they arrived in China, they were taken to a "nightclub" in Yiwu, Zhejiang and required to provide sexual services. On August 1, the Russian Consulate General in Shanghai said that the Chinese police in Yiwu have rescued the two women and now are helping them return to Russia. What is the Foreign Ministry's response to it? A: I am not aware of the situation mentioned by you. Q: The Myanmar government says that it wants to massively reduce the scale on the investments in the Kyaukpyu projects, and it is currently in discussions with China about this. Can you tell us how the negotiation is going? Does China agree with Myanmar's plan to downsize the investment? Myanmar officials say that downsizing the project is actually very good for China, because it shows that China understands that some of these very large-scale projects in poor countries are not necessarily beneficial for the host county and not necessarily beneficial for China's Belt and Road Initiative. Do you have any comment on that? A: I haven't seen the words of Myanmar officials as you mentioned and I need to check on that. What I want to say is that China supports Chinese enterprises in working with the Myanmar side for progress in the Kyaukpyu projects on the basis of equal-footed negotiations, mutual benefit and win-win outcomes, so as to promote the socioeconomic development and improve the livelihood there. According to my information, the two sides are in commercial negotiations on the projects now. I will refer you to relevant authority and enterprise for specifics. 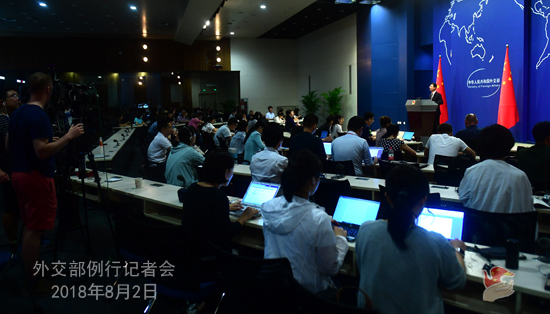 Q: The US Senate passed the 2019 National Defense Authorization Act, which is set to reinforce Taiwan's defense capability and expand joint training, arms sales and high-level military exchanges with Taiwan. It also advises the US Department of Defense to advance military exercises with Taiwan. What's your comment? A: The Chinese side has already made clear its position before, and lodged stern representations with the US side for many times. 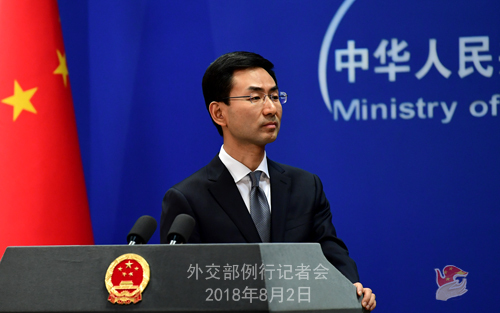 We urge the US to discard the outdated cold-war and zero-sum mentality, stop allowing the bill that contains negative China-related content to pass into law and refrain from implementing the relevant clauses, lest it should undermine the China-US relations and the cooperation in key areas. As to the Taiwan-related issues, I shall stress again that the Taiwan issue concerns China's sovereignty and territorial integrity, and it is the most important and sensitive issue at the core of China-US relations. We firmly oppose any official exchange and military contact between Taiwan and any country. We demand that the US should abide by the one-China principle and the three China-US joint communiqués to properly handle the Taiwan-related issues. Q: On July 30 local time, Zimbabwe held presidential, parliamentary and local elections, and the results of the elections are being released. On August 1, the supporters of the opposition party took to the street, leading to unrest in some areas. The army helped the police dispel the demonstrators, which caused casualties. What's your comment? A: Recently, Zimbabwe held the presidential, parliamentary and local elections, which marks a major event in the political life of the country. As a friendly country to Zimbabwe, China has been closely following the situation in Zimbabwe. Upon invitation, China sent a delegation to observe the elections. According to what they observed on the ground, the Zimbabwe people are highly engaged in the elections, which are carried out in a peaceful and orderly manner in general. We have noted those reports on what happened after the elections, and hope that the relevant parties in Zimbabwe will bear in mind the interests of the state and their people and jointly maintain the peace, stability and development in Zimbabwe. Q: US White House officials reportedly said that the US could resume official talks with the Chinese side only when China agrees to open the market for more competitions and stop retaliatory trade measures. What's your comment? A: We already stated China's stance on the China-US trade issue on many occasions, and I'm not going to repeat that. Regarding to what the US side said about returning to talks and negotiations, I responded to that yesterday. China remains open to dialogue, as long as it is based on mutual respect, equality, rules and credibility. Coercing and pressuring others unilaterally on the part of the US would only be counterproductive.